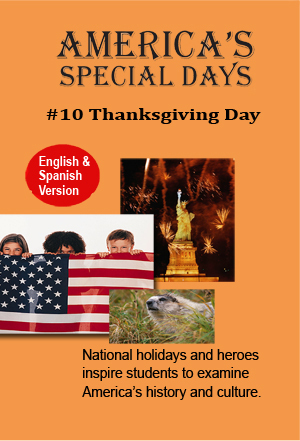 America’s Special Days joins Francesca in observing how and why Thanksgiving is celebrated in America. From the very first Thanksgiving in Plymouth Colony when the Pilgrims and the Native Americans celebrated together, to present day family gatherings, Americans have set aside a special day to remember our many reasons to be thankful. A variety of celebrations are featured with ethnic foods. Cultures highlighted are Hispanic, Asian-American, African-American and Anglo-American. We also visit a homeless shelter. Notice the variety of family structures, including the extended family, one parent family and traditional family.